In this week's Farm News, I mentioned a little something about a carrot contest. 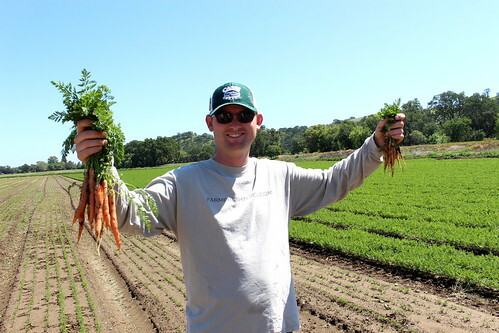 After you root around our carrot story and enjoy a few photos from our fields, leave us a comment or two with your creative carrot name or story! If you have one of the best comments, there just may be some "carrots" in it for ya! Carrots - Really Good Ones! The sweet smell of carrots fills the air surrounding the field that we have broken open for the carrot harvest. Beautiful, sweet, crunchy and tender carrots are organized on the bed in two lines, each with their roots pointing toward the center of the row. Their green tops hang down into the furrow. The group of people who have plucked the carrots from the soil work quickly, keeping up with the tractor that is running a blade below the roots of the carrots to loosen the soil. Carrots in my hand on the left are almost ready for harvest. Carrots in my hand on the right still have a ways to go. A second crew bunches the carrots, shaking off as much of the residual loam soil that still clings to the root before banding a bunch together with a twist tie and putting them into a reusable plastic container that is destined for the packing house where the last of the soil will be washed from the gems. The team treats the carrots with great care. These carrots are SUPER SWEET because they have lots of natural sugars in them, which also make them delicate and prone to easily snapping in two. The key to amazing carrots is simple – the variety. 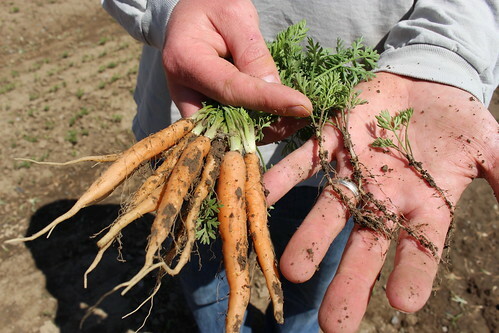 Most carrots grown are selected to grow large, straight, last a long time and to not break during the harvest, packing and transportation process – ever notice how bendy some carrots are? The oversight in this process is that characteristics like taste and texture are ignored. 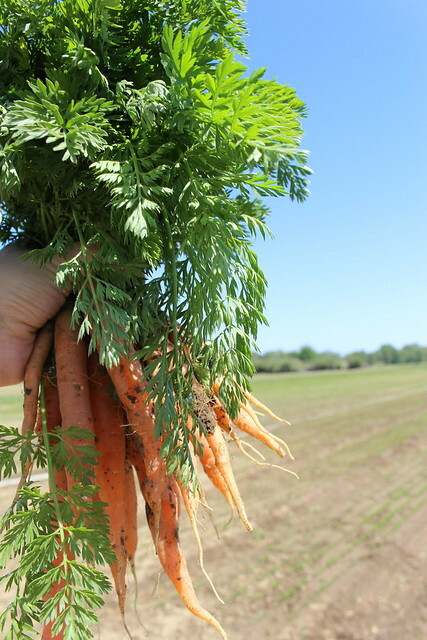 We grow a variety called Nantes, named from the place in France where humans first bred really good-tasting carrots. 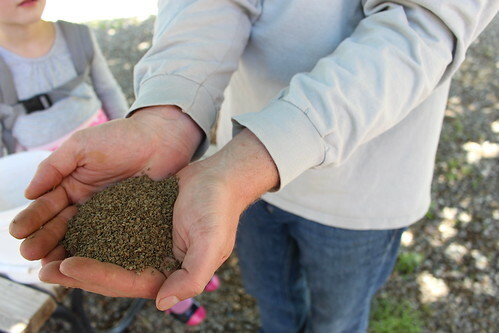 The seed is the secret to our amazing carrots, but seeds need to be put into the right circumstances to thrive. 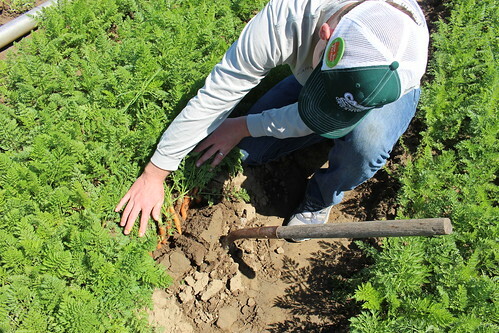 We work our carrot soil deep, taking care to ensure that the carrot root can easily make its way eight plus inches into the soil. Beds are made perfectly smooth and a special seeder is used to precisely seed each bed with six lines of seeds, separated by 3/4 of an inch down each line. 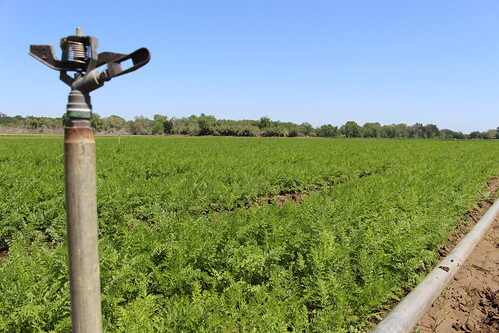 The result is a plant population of nearly one million carrots per acre! These little seeds are irrigated with overhead sprinklers on a schedule that is customized to the stage of the carrots growth. Carrots are slow to germinate, taking almost two weeks to get out of the ground. We take lots of care to ensure that we have grown and removed as many weeds as possible before the carrots are planted, and the weed seeds that do germinate are pulled out by hand. Once the carrots get established, their tops easily cover the bed, absorbing the beautiful sunshine and delivering it to the roots. The last step in the process is to wash the carrots and to place a band around the carrots themselves to minimize the jostling that can shatter the precious roots. I know that I often find a tip of a carrot in the bottom of my Farm Fresh To You box and have no problems eating it before the rest of my family can get to it! Over the years, I’ve heard some great stories and names for our carrots. I know some of you ration them out, one per family member, not forgetting the dog. Others have called them "Candy Carrots." Enter our carrot contest by leaving your creative carrot comments on this blog post below. Enter as many times as you'd like before Friday, May 9th, at 8:00 p.m. I've shared our carrot story - what's yours? Can you come up with a good name for our carrots? On Monday, May 12th, we'll pick the 3 best carrot comments and announce the winners here on our blog post and by responding to the email included with your comment. Winners will receive a credit to their Farm Fresh To You account. 1st Place: $31.50 - 2nd Place: $20.00 - 3rd Place: 15.00. No purchase required to enter giveaway. No limit on the number of entries. Entries will close on Friday, May 9th at noon. Three total winners, (1) $31.50, (1) $20.00 and (1) $15.00 winner will be chosen by merit of comment and announced on Monday, May 12, 2014 on this blog post and via email included with winning comment. Email addresses shared in the comment will not be displayed publicly and will not be used for any purpose other than to notify the winner. *Prizes are not redeemable for cash and can only be redeemed for use on Farm Fresh To You deliveries. 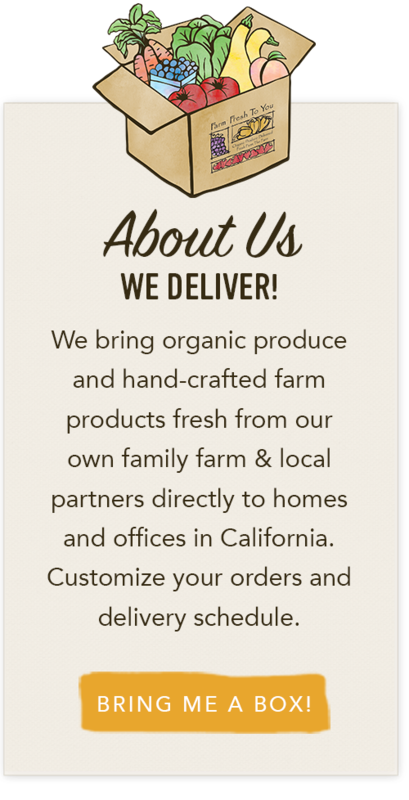 Contest is open to Farm Fresh To You members and California residents who are eligible to receive a Farm Fresh To You delivery by being over the age of 18 and by living in our delivery area. Check our Delivery Areas here. Thank you for all the wonderful stories and name suggestions. We are so impressed and flattered! 1st Place: Rhea who said: Nantes Your Average Carrot. 2nd Place: Liz who said: When we moved into our home 16 years ago, we quickly discovered that our next door neighbor was not just a gardener, but a farmer. He was a retired railroad engineer who grew enough produce on his extra 1/2 lot to feed the entire block. Steve grew many things, but he was best known for his carrots. He swore that Nantes Red were the best variety, and you couldn't stop by his house without digging up a few to take home. All the neighborhood kids loved "Steve's carrots". On Halloween he would make a special bag for each child on the block containing a piece or two of candy and several sweet Nantes carrots! Steve passed away this spring, aged 98, and we miss him sorely. However, thanks to Farm Fresh To You, we are still able to enjoy "Steve's" carrots. He was right. They really are the best. 3rd Place: Yvonne who said: These are truly the most delicious carrots I've ever purchased and can't bring myself to cook them, usually savoring one (or 1/2) after dinner. I'd say they are like "diamonds in the rough" and "worth their weight in gold" so how about Capay's "Kandy Karats". Congratulations Rhea, Liz and Yvonne! Giveaway! 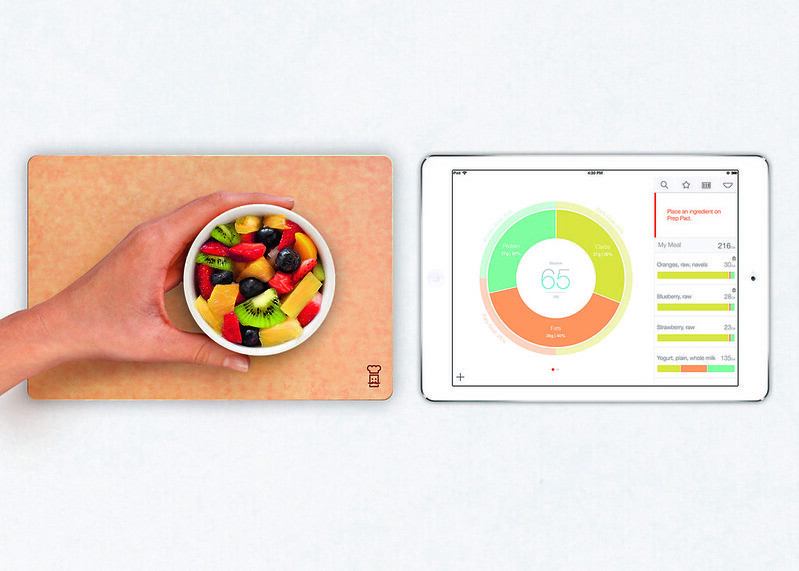 We are very excited to team-up with The Orange Chef Co. (a neighbor to our Bay Area folks) to offer Prep Pad, the smart food scale that visualizes nutrition, to one of our lucky customers just in time for Mother’s Day. Let's face it, Moms are like superheroes, but with all of her day-to-day responsibilities, she doesn’t always have time to measure food and calculate proteins and carbohydrates. This is where Prep Pad comes in. This American-made 9-inch-by-6.25-inch scale is sold on The Orange Chef Co. website and at Williams-Sonoma, and works with the Countertop app on your iPad, to display a breakdown of proteins, carbohydrates and fats as you build a meal (an iPad 3 or newer is needed). Most of us have a good idea of what foods are healthy and what foods aren’t, but building a well-balanced meal of correct proportions can intimidate even a seasoned health food enthusiast. Prep Pad’s guidance is conveniently built into its display. To begin, create a profile based on your individual characteristics and goals on Countertop. Once you've done this, you're ready to begin adding ingredients to Prep Pad. You can do this by scanning a bar code, using the voice command feature, or searching the database of 300,000+ food items. From there, two rings will appear on screen. The outer one is the original recommended breakdown of carbs, fats, proteins, and calories per day. The inner ring tells you if you have the right balance. 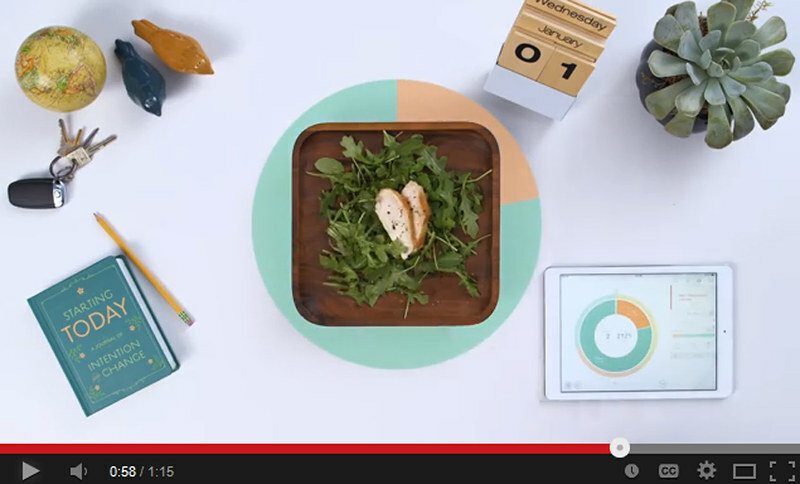 In addition to a visual pie chart display of protein, carbs and fats, Countertop also displays a balance score (out of 100), plus the total calories per meal count. The balance score will give you a real-time indication of how close you are to hitting your original goals; a simple visual nudge in the right nutritional direction. Coupled with fresh ingredients from your Farm Fresh To You deliveries, Prep Pad will help restore balance to your kitchen. giveaway to one of you! Thank you to The Orange Chef Co! To win a Prep Pad, simply leave a comment answering the question below. Note: an iPad 3 or newer is needed for display. What are you looking forward to cooking or eating in celebration of Mother's Day? Can't wait to get started with your own Prep Pad? Receive 10% off when you purchase online and enter the code: WELOVEMOM. Code valid through May 6th. 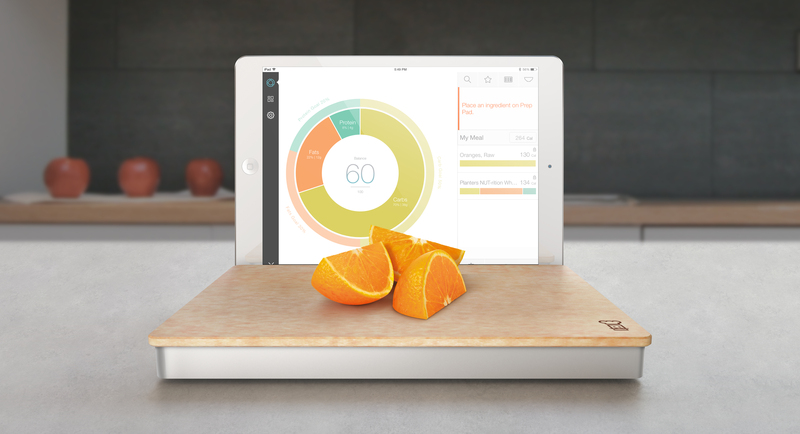 The Orange Chef Co. Prep Pad retail value is $149.95 and does not include the iPad. No purchase required to enter giveaway. Limit one entry per person. Entries will close on Tuesday, May 6, 2014 at 5:00 p.m. Winners are chosen by Random Number Generator and announced on our blog on Wednesday, May 7, 2014. A big thank you again to The Orange Chef Co! Be sure to check out Prep Pad. During event season we look forward to welcoming guests to our farm to see sustainable agriculture in action and learn how it benefits our local economy and community. In the last year, we've also been thrilled to add farm-to-table, seasonal dinners to our events calendar. For these dinners your farmer, Thaddeus, collaborates with progressive local chefs and restaurants who pride themselves on finding the best locally and sustainably-grown, organic produce and artisan products. Here's a glimpse of the fun we had at the first five events of our 2014 season. Hope to see you at an upcoming farm event! Click here to see more photos from our Seasonal Dinner at Wilshire Restaurant. This past February, guests enjoyed a unique dining experience with their farmer Thaddeus at the Wilshire Restaurant in Santa Monica. 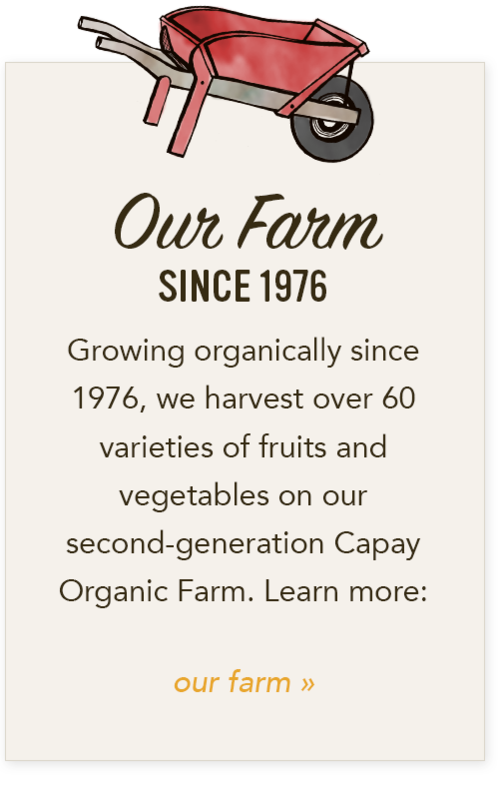 The chef prepared a delectable 4-course meal with some of the season's best, organic ingredients from our Farm Fresh To You farm, Capay Organic. The evening began with the opportunity to mingle with Thaddeus and winemakers from Topanga Vineyards and Palmina Winery. During the dinner, Thaddeus, the Wilshire team and winemakers shared about the farm-fresh ingredients, the making of the meal and the craft of wine-making and food-pairing. 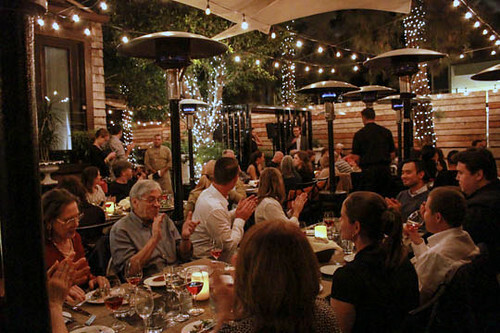 Our Seasonal Dinners benefit the Kathleen Barsotti Non-Profit for Sustainable Agriculture. 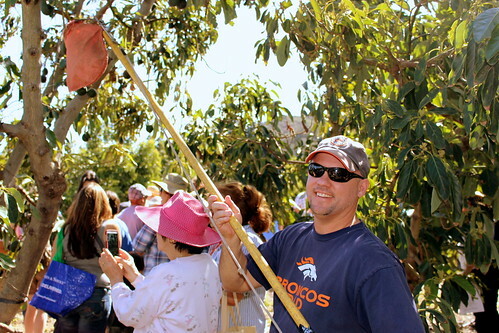 Click here to see more photos from our March Farm Tour in Capay. Tractor tours, a harvest activity and beautiful scenery are the highlights of our Northern California farm events. Guests can picnic and there are plenty of activities for both kids and adults. We offer farm-fresh produce at our market stand. Listen in on a Farm Talk from Thaddeus or one of our farm staff. 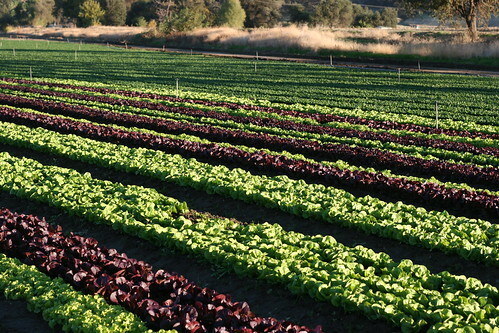 We encourage you to come and connect with the land that grows your food. Click here to see more photos from our March Farm Tour in Bardsdale. In Southern California we welcomed folks to our farm nestled in the hills near Bardsdale. Everyone enjoyed a day of arts & crafts, a farm talk with Thaddeus, an avocado harvest activity, picnicking, a market stand and more! 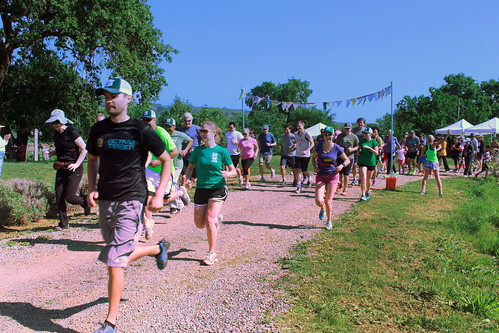 April 12 marked the first "5K Fun Run with your Farmer" on our farm in Capay. 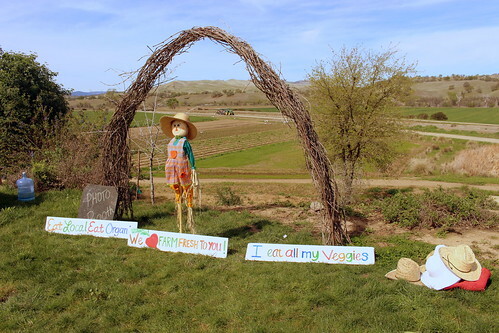 This family friendly course followed a scenic route alongside the new spring crops. Thank you to everyone who joined us and helped raised proceeds to benefit the Kathleen Barsotti Non-Profit for Sustainable Agriculture (KBNP). Nothing signifies spring like fresh strawberry harvesting at our partner farm, Stehly Farms Organics in Valley Center. 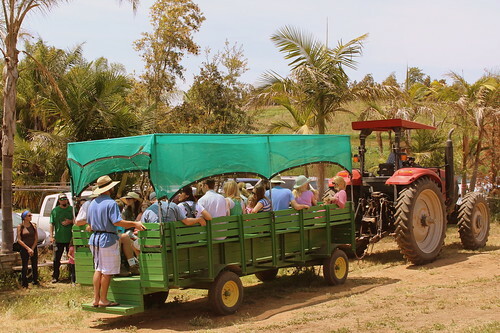 Guests enjoyed a learning more about sustainable agriculture, kids' activities, a tractor-tram ride, petting zoo and more! Upcoming: More Fun on the Farm! It's not too late to join us for some farm-style fun this year. For more details about our upcoming events, check our the Events Page on our website. 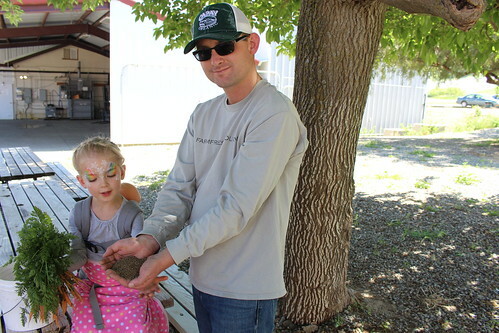 We hope to see you at one of our Farm Events this year! 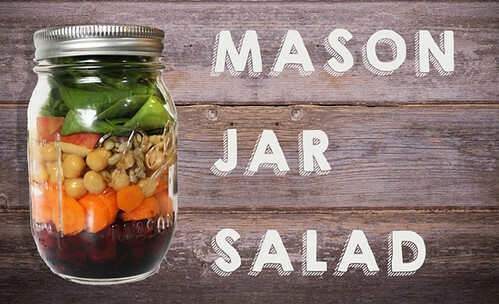 Bust out of your lunch rut with a mason jar salad! Besides the fact that a salad in a jar looks lovely, this tasty trend is simple to prepare early in the week for an easy grab-and-go, healthy lunch solution. Here's how to mix it up! The name of the game is layers. 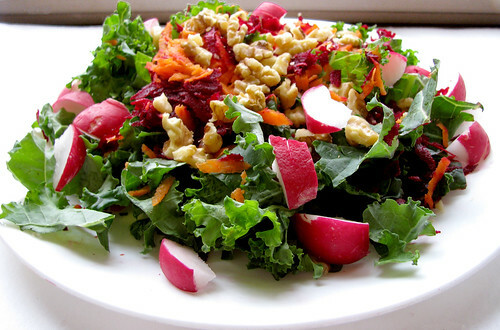 The basic idea when packing salad into jars is to start with the most hearty and less-absorbent ingredients first. Begin with the dressing on the bottom of the jar and work your way up through the lighter ingredients until you end up with the leafy salad greens. 1. Salad Dressing: Pour your favorite salad dressing into a pint (for a nice side salad) or quart (for a larger salad) size jar. The wide mouth style of jars work well. 2. 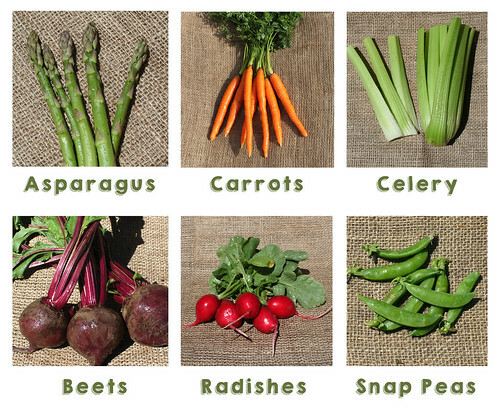 Hearty Vegetables: Next, add a layer of more firm, heartier veggies such as carrots, radishes, beets and those shown below. 3. Grains, Pasta or Proteins: Next, add a layer of your favorite cooked beans, rice, pasta, grilled chicken/steak or marinated tofu. 4. Softer Vegetables and Fruits (optional): Next, add any soft vegetables or fruits, like avocados, tomatoes, strawberries or dried apricots. TIP: If you're making salads ahead to eat throughout the week, wait to add these ingredients until the day you're planning to eat the salad and add them to the top of the jar. 5. Nuts, Seeds and Lighter Grains: Next, add any nuts or seeds, like almonds, walnuts and sunflower seeds. 6. Salad Greens: Last but not least, fill the rest of the jar with your leafy greens like lettuce, spinach, shredded kale or arugula. 7. Tossing and Eating the Salad: When ready to eat, give the jar a gentle shake to incorporate the dressing, unscrew the lid and empty onto a plate and enjoy!